Funds for projects relating to the repair or regeneration of historic buildings may be identified through streams relating to: heritage; arts & culture; community development and the environment. Every project is unique, availability of funding can be competitive and sources will dependent on whether a building is in the ownership of a private owner, a private developer or a building preservation or charitable trust. Key to the progression of a funding proposal is the vision and ambition of the owner/group, including activites that are going to happen in the building; whether there is identifiable need for the project and whether proposals indicate a sustainable, long-term re-use. *Please note this is not an exhaustive list of all funding available for the historic environment but a tool for raising awareness and signposting fund seekers in the right direction. Updated April 2019. Previously, the Department of the Environment, Historic Environment Division provided an annual Historic Environment Fund for eligible works on Listed Buildings to private owners in Northern Ireland. Please note that this grant aid scheme is subject to funding availability and that application for 2017/2018 have now closed. For up to date information on the availability of grant aid please contact the Historic Environment Division here. The Ecology Building Society is a specialist mortgage provider, focusing on renovation or new build mortgages on properties and projects that respect the environment. It is particularly interested in projects designed to bring derelict and dilapidated properties back into use. More information can be found on the Ecology Building Society website. Rural Development Programme- DEARA (Department of Agriculture, Environment and Rural Affairs)- Some funding may be available for rural development projects under the DEARA Rural Development Programme. More information is available at: www.daera-ni.gov.uk/topics/grants-and-funding. OFMDFM Good Relations Community funding- The Strategy outlines how Government, community and individuals will work together to build a united community and achieve change against the key priorities of young people; shared community & cultural expression. More information is available at: www.ofmdfmni.gov.uk/central-good-relations-funding-programme. NITB support the local tourism industry. Funding programmes include Capital Development Fund. Please note that NITB does not provide financial assistance towards the provision of tourist accommodation. This is supported through Invest Northern Ireland (details as below). You may also wish to speak to your local council Planning, Economic Development or Regeneration Departments to see if there are any other local initiatives you can contribute to or get involved with to link in to your project. See a general list of all local authority website and contact information here. The Architectural Heritage Fund is a London based charity that can provide advice, information and financial assistance, in the form of grants and low interest loans, to Buildings Preservation Trusts and other charities undertaking work to historic buildings. They cannot help private owners, or buildings in continuing long-term ownership or use. AHF have a network of local officers based in each UK nation, who can offer advice and support to your group, whatever stage you are at. The Northern Ireland Support Officer can be contacted here. The Architectural Heritage Fund has compiled a further useful source of advice and information, which should be of some relevance to Northern Ireland. The Funds for Historic Buildings website can be found at: www.heritagefundingdirectoryuk.org. The Heritage Funding Directory UK website is also a useful source of information with a free searchable database as well as advice on how to maximise the chances of success when making a funding application. The National Lottery Heritage Fund has a number of grant programmes that may be applicable to projects involving an historic building or area, such as a conservation area or public park. To be supported, projects must relate to the national, regional or local heritage of the UK and should aim to conserve or enhance our diverse heritage, encourage more people to be involved in their heritage and make sure that everyone can learn about, have access to and enjoy their heritage. Applicant organisations must be not-for-profit and can include charitable organisations, such as local community groups or building preservation trusts, ecclesiastical bodies, local authorities and partnerships. The Northern Ireland Office can be contacted here. The Northern Ireland Council for Voluntary Action (NICVA) is a further useful source of advice and information on grant giving trusts. They have an extensive Grant Tracker funding database which lists different types of funding out there for communities and charities- www.grant-tracker.org. Further details can be obtained through the NICVA website. The Community Foundation NI was established in 1979 as the Northern Ireland Voluntary Trust before changing name to the Community Foundation for Northern Ireland in 2002. Throughout its history it has been committed to addressing the challenges of peacebuilding, social justice and effective community development. We work in partnership with communities, encouraging them to be proud of who they are and what they have achieved; and with donors local and international, helping connect them to people and projects who are transforming our community. Contact Community Foundation NI here. Development Trusts Northern Ireland (DTNI) have established a Community Asset Transfer Demonstration programme. The programme supports current concepts on Social Enterprise and tests the NI Executive’s enabling framework policy proposals in support of the transfer of surplus public sector assets to organisations in the community and voluntary sectors. If you think your project may be eligible, go to the community assets on the here. The Ulster Community Investment Trust (UCIT) is the key provider of social finance, free advice, business support and mentoring to the social economy sector in Northern Ireland and the Republic of Ireland. The loan fund has supported tourism initiatives, rural development and community enterprise projects in Northern Ireland. More information is available on the UCIT website. One organisation that has combined the benefits of heritage with tourism accommodation is the Irish Landmark Trust. The Irish Landmark Trust is a non-profit organisation that finds interesting and unusual properties that are in need of conservation, and work with the owners/ acquire the buildings to give them new life. Since 1992 they have been turning historic buildings into truly special self-catering holiday accommodation showcasing the art of the possible. The properties range from lighthouses and schoolhouses, to castles and gate lodges. More information on their current projects can be found on the Irish Landmark Trust website. For more information on reduced-rating for renovations and alterations to empty residential properties see here. For more information on Zero-rating approved alterations to protected buildings see here. 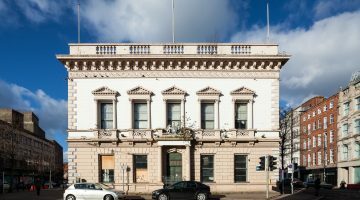 More information on rates exemptions for listed or vacant buildings can be found on the NI Direct Government services website. *Page last updated March 2018. Please note this is not an exhaustive list of all funding available for the historic environment.